La investigación de Karen gira en torno a las relaciones y los procesos dentro y entre organizaciones. En particular, ella está interesada en la colaboración, la cultura y el comportamiento. Cómo la gente da sentido a la complejidad cultural en su vida laboral cotidiana es un interés primordial en su trabajo académico. Durante su doctorado Karen presentó su estudio en diferentes conferencias internacionales, enseñó en varios cursos académicos y era mentor de estudiantes de posgrado. Actualmente, Karen trabaja como investigadora y consultora en la región de América Latina. Ella apoya a los miembros de la organización en el desarrollo de la colaboración entre culturas, el cambio organizacional y las iniciativas de crecimiento. Ella también ha sido contratada para proyectos de investigación que buscan entender las experiencias de los empleados o distinguir las lecciones aprendidas. Haga clic aquí para ver las publicaciones de Karen. Van Marrewijk, A., Ybema, S., Smits, K., Pitsis, T., Clegg, S. (in review) Clash of the Titans: Temporary Organizing and Collaborative Dynamics in the Panama Canal Megaproject.Van Marrewijk, A. and Smits, K. (2014) Projectscapes: the role of spatial settings in managing complex megaprojects. International Journal of Complexity in Leadership and Management, Vol. 2, No. 4, pp 278-292. Smits, K. and Van Marrewijk, A. 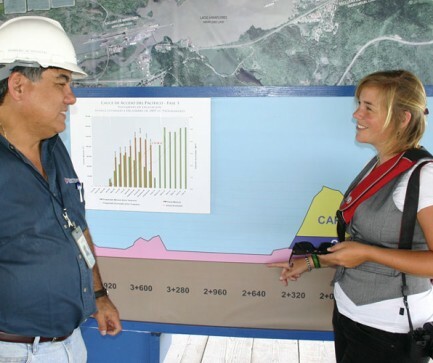 (2012) Chaperoning: Practices of Collaboration in the Panama Canal Expansion Program. International Journal of Managing Projects in Business. Vol. 5, Iss. 3, pp. 440-456. Smits, K., Van Marrewijk, A., & Veenswijk, M. (2015). The Collabyrinth of Cross-cultural Collaboration in the Panama Canal Megaproject. In A. Van Marrewijk (Ed. ), Inside Megaprojects: Understanding the Cultural Practices in Project Management (pp. 103-136). Copenhagen: CBS Press. Roessingh, C. and Smits, K. (2010) Social Capital and Mennonite Entrepreneurship: the case of Circle R in Blue Creek, Northern Belize. International Journal of Innovation and Regional Development, Vol. 2, pp. 22-35. Smits, K. Van Marrewijk, A and Veenswijk, M (2015) Inside the Panama Canal Expansion Program: A Collabyrinth. In: Inside Mega Projects: Understanding Cultural Practices. Copenhagen, Denmark: Liber & Copenhagen Business School Press. Smits, K. (2013) Cross Culture Work: Practices of Collaboration in the Panama Canal Expansion Program. Delft, Netherlands: Next Generation Infrastructures. Smits, K. Van Marrewijk, A and Veenswijk, M (forthcoming) Inside the Panama Canal Expansion Program: A Collabyrinth. In: Inside Mega Projects: Understanding Cultural Practices. Smits, K., Nabben, B. and Kok, A. (2009) Changing borders in Blue Creek. In: Between Horse & Buggy and Four-Wheel Drive: Change and Diversity among Mennonite Settlements in Belize, Central America. Edited by C. Roessingh and T. Plasil, pp 73-96. Amsterdam, The Netherlands; VU University Press. Smits, K (2014) Chaperoning: Collaboration between the Panama Canal Authority and CH2M Hill in the Panama Canal Expansion Program. Hydrolink, 2014, Vol. 1, pp 19-22. Smits, K. (2014) Summary of the Study “Cross Culture Work: Practices of Collaboration in the Panama Canal Expansion Program”. 100 Years of the Panama Canal: Celebrating the Centennial 1914-2014, pp 114-115. Smits, K. (2013) The Intercultural Project Organization: A Collabyrinth. Newsletter PMI Netherlands Chapter, July 2013, pp. 6. The Netherlands. Van Marrewijk, A. and Smits, K. (2014) Understanding Cultural Practices of Governing Mega-Projects: the case of the Panama Canal Expansion Program. Paper presented at the 28th IPMA World Congress, Sept. 29 – Oct. 1, Rotterdam, The Netherlands. Smits, K. and Van Marrewijk, A. (2013) Cross Cultural Collaboration in the Panama Canal Expansion Program: A Collabyrinth. Paper for the 29th EGOS Colloquium, July 4-6, Montreal, Canada. Smits, K. (2011) Collaboration in Infrastructural Mega Projects: Cultural Interfaces in the Panama Canal Expansion Program. Paper presented at the 7th International Critical Management Studies Conference, July 11-13, Naples, Italy. Smits, K. (2011) Collaboration in Infrastructural Projects; Cultural Interfaces in the Panama Canal Expansion Program. Paper presented at the 11th EURAM Conference and at the Doctoral Colloquium, May 31- June 4, Tallinn, Estonia. Smits, K. and Van Marrewijk, A. (2009) No Man Is an Island: Collaboration in the Panama Canal Expansion Program. Paper presented at the 13th APROS Conference, December 6-9, Monterrey, Mexico. Smits, K. (2008) Collaboration in Infrastructure Projects. Poster presented at Fresh Perspectives PhD Conference, September 2008, VU University, Amsterdam, The Netherlands.